2016 is going to be another great year for Jordan heads. 2016 continues to heat up as Jordan Brand is set to bring back a heavy hitter in the Air Jordan 17. In the 13 years since its debut in 2002 there has only been one retro release, which was in 2008 as a part of the Jordan 17/6 Collezione "Countdown Pack" alongside the "Carmine" Air Jordan 6. That Jordan is bringing back a relatively new model is something of a novelty – we know that at one point Jordan Brand was toying with the idea of bringing back the Jordan 16, but that plan was scrapped. After the Jordan 15, no new models have been retroed outside of the upcoming one-off "Chicago" Air Jordan 23 and the Air Jordan 20s this year. Two colorways of the Air Jordan 17+ are scheduled to release in the second quarter of 2016. One is the single OG 17+ pair, the "Copper," while the other will come in a new Bulls-themed black, red and white. Both pairs sport the shroudless 17+ upper with croc-skin detailing wrapping around the heel. There's no word on the regular, shrouded version of the 17 coming back at this point. Expect the Air Jordan 17+ Retro to retail for $250 when it makes its retro return. Look out for the Air Jordan 17+ Retro to release during the second quarter of 2016. Sole Collector will provide sneaker release dates as they become available. 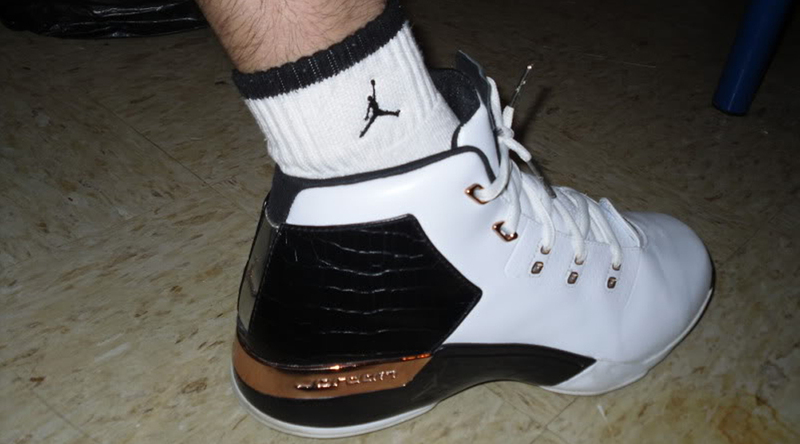 Note that the above image is of the original "Copper" Jordan 17+ and not the upcoming retro.